The works I am sharing in this show are a glimpse into my creative process spanning almost twenty years. It is hard to believe it has been that long since I attended the New York Studio School of Drawing, Painting and Sculpture, a place I truly loved. In twenty years much has happened, and my images, gently share, some of the steps taken. At first it began with line: a piece of charcoal to paper, a series of abstracted lines in space really, it told the story of a letter, a letter she wrote. Then the story continued, and pieces and parts of drawings came apart, and back together again, to form collages, and portraits of sorts. Until one day the story unraveled. And from the brink a new one began. 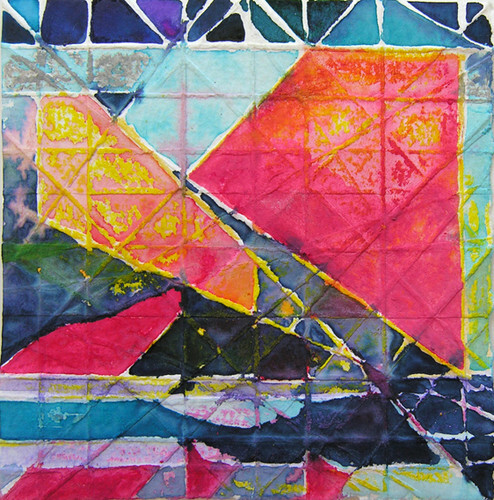 The folded watercolors emerged as a form of mending, an expression of pure joy, and they too will leed - to many other bodies of work. 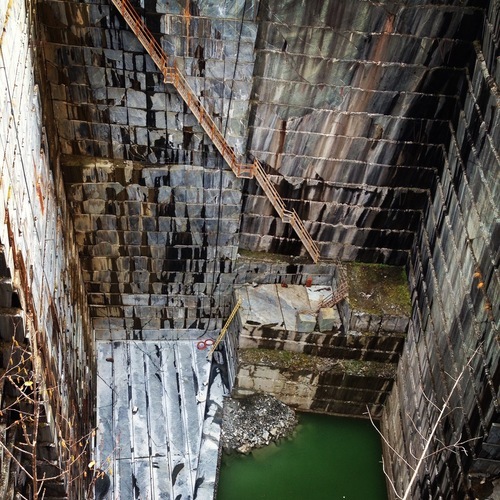 Here in this show are included photographs of water and pigment floating and moving, as well as an inspirational photograph of the lines on the Verde Antique stones in the Rochester Vermont Quarry. Also included are collages that began as conversations with postage stamps, as if finding kindred-spirits, in itty-bitty-statements. The works in this show are each a part in a series, each series its own, and when put together this way - they form a kind of collage, and tell in abstract terms the beginning of a story. If I delve a little deeper and expand on my artist statement, I find myself in a space where words are harder to come by. If I place the images in chronological order, I am stunned to see they follow my journey along side me. When I was a student, first starting out, my teacher informed me, I was to work only in black and white for a semester -- and I just about threw a tamper tantrum! I love color I exclaimed! But I complied, and I did find, a profound love for line, as well as a deep connection - to the contrast that light can bring - to black and white. In time, color returned to my work, and it returned more informed and more focused. Today, when I look at this particular selection of work, I can see a time, when my charcoal drawing was my-everything, and would inspire, in years to come, numerous other images. 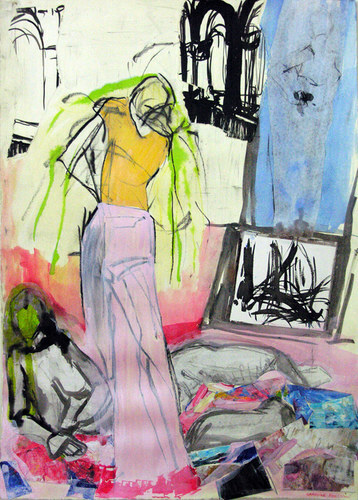 In this show line, color, water, watercolor and collage, as well as photography all work to express when words fail me. 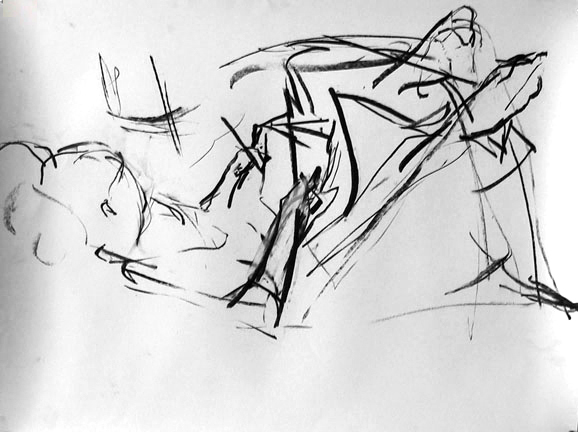 it is a portrait of one woman rising from her bed after giving birth, and seeking herself again. It is also a portrait of another woman, who has never given birth. She stands looking down at the dress she is finally allowed to wear. Because for eons, or as far as she can recall, many women stood without clothing in painting - and this woman wanted to wear her very own clothes -- so in 2005 she dressed herself, in bright colors, painted over black and white drawings. 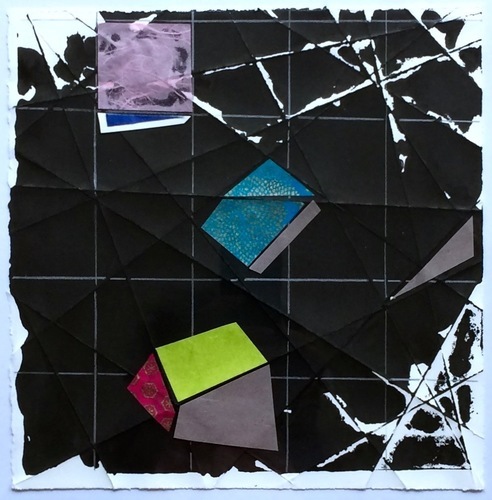 After the collage series many other works followed until one day the watercolors on folded paper began. They started very small, and origami was my inspiration – as well as sails, which were a way to escape, and find solace, along with a peaceful space within. I have given two talks about the folded watercolors in this show, as well as the process in making them. Both talks are now available on line so I will not spoil the fun of finding them, and will continue with the other images tonight. But if you have any questions I am happy to answer them at the end of the talk. Over the years, I have taken numerous photographs. They are a form of inspiration, but also a way to look at my artwork. I had no idea when I took the photograph of the Quarry in 2013 that it would inspire my collage in 2017. And I also did not know how important seeing thru the lens so to speak would become for my artwork. In 2017, I began creating images using various wet medium. I longed for circles instead of diagonals and horizontals. 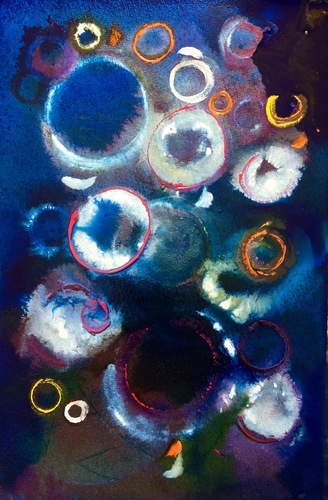 This work is done on a flat surface, and the pigments float on the water. It takes a very long time for them to dry; so while the pigments are dancing on the water, and pooling, and drying, I take photographs of the process. This work came after a very lively conversation I was having – and am still having – with postage stamps. The postage stamp –collages- are in essence a conversation with a particular stamp, or stamps. They are a way to see the work of another, and see how I might speak with them in visual terms. Another conversation happening in this show is one of healing. I have recently been diagnosed with bipolar disorder, and after two hospitalizations (2011 & 2016), I can see my work shares the journey as well. From dark days to lighter ones, from moments of elation to sheer joy in recovery, I can see myself raveling and unraveling in these works. 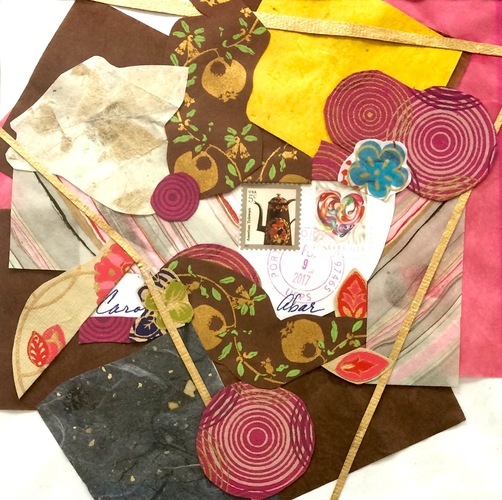 I think the collages arrive as a way to reconfigure not only pieces of paper into meaningful wholes, but as a way to put back the pieces of myself after a break down. And I think at times the lines are a way to hold onto something, when things are tentative, but also affirm hope when life is mending. This show truly is but a glimpse, into a process that is highly creative, meditative, and full of surprises, and joys.